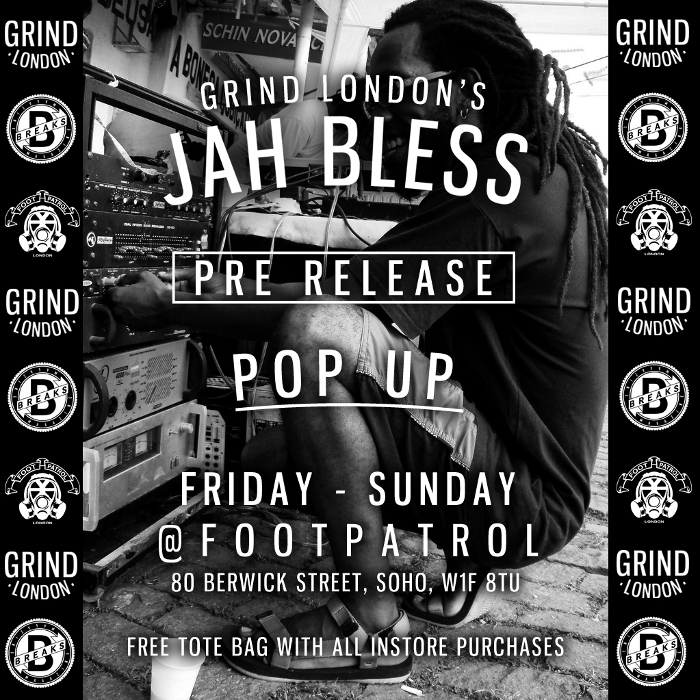 Footpatrol and Breaks Magazine present a weekend-long pop up space as a pre-release of Grind London’s new Autumn/Winter 2013 collection. Taking over a space inside the Soho store, Grind will offer their new collection exclusively at Footpatrol starting this Friday, before releasing elsewhere and online next week. The new collection from the London-based brand is titled ‘Jah Bless’ takes its cues from dub and reggae roots culture which has its own very special part to play in London’s history. My highlights so far include a printed longsleeve tee & a clean embroidered bucket hat, but I’m looking forward to seeing it all in more detail this weekend. Head to the store this weekend to see what they’ve done with the space and get your first look at the collection in person. All purchases made over the weekend come with a free tote bag too which makes it all the more special. Further details follow below, as well as more from the brand at Grind London.